GOGLA, Lighting Global, AT Kearney, etc. 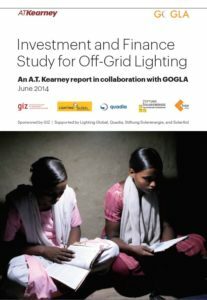 This study reviews the market for solar off0grid lighting products and concludes that improved financing can promote the industry growth. The market consists of about 1.3 to 1.4 billion people at the bottom of the pyramid who have no access to electricity, This group ‘s primary sources of light are kerosene lamps and battery operated flashlights. By comparison, modern solar lamps offer lower costs , better quality of light and an improved social and environmental impact. Currently, this group invests an estimated $30 billion per year buying kerosene for lighting purposes. The cost to supply equivalent light with solar equipment in estimated at $2.7 billion. This frees up $27 billion for use elsewhere, such as further investments in solar systems.